Thanks for visiting Medieval Romances and participating in the Heartbreaker Blog Hop! As a gift to Medieval Romance visitors, we have a free medieval romance novella – The Bride and the Brute by Laurel O’Donnell. For this Heartbreaker Blog Hop, we will also be giving away a $10 Amazon Gift Card! All you have to do to be entered is subscribe to the Medieval Romances blog and leave a comment below on this post. The comment box is below the large list of blog hop sites. You’ll find an easy-to-use subscription button right beneath the scrolling book covers in the upper left area of the site on the home page. Please remember to leave your email in the comment if you want to be notified of your prize if you win! 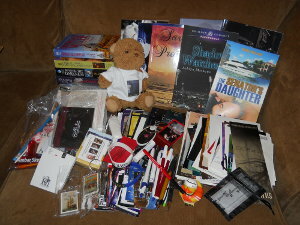 There are THREE grand prizes for this Blog Hop. You as a reader can go to EACH blog listed below and comment with your email address and be entered to win. Yep, you can enter over 300 times! 50+ bookmarks, cover flats, magnets, pens, coffee cozies, and more! This entry was posted in Events, Promotions and tagged blog hop. Bookmark the permalink. I love these kinds of books 🙂 thanks. Subscribed!! Thanks for the giveaway!! Hi! Thanks for hopping. I love hops because I find new authors. thanks for the giveaway. i LOVE medieval romances! I love historicals but haven’t read much medieval romance. My to read list could use to some additions! Love romance!!! Thanks so much. Love both heartbreaker and a hearthrober, who wouldn’t…. I may not have much experience in the whole love department, but I have had my heart broken. Being considered a Heartbreaker can come from various actions that you do. I am a newbie when it comes to reading romance books but what I have learned is that it is not bad to have a chiseled body or an amazing personality. If you look at it over all, if you never put your heart out there, you may never have a chance at true love and happiness. I may get broken once in a while but only you are strong enough to pick yourself up and try all over again. One of my favorite Heartbreakers is Taylor Qualls the Earl of Sandlin from the book His Impetuous Debutante. Lady Phoebe kinda reminds me of myself, accident prone and finding trouble in every corner. Taylor doesn’t think he is good enough for Phoebe, so he’s a heartbreaker and doesn’t know it. I subscribe by email. Thanks for the giveaway. Thanks for participating in this awesome hop. Have a good one! Love historical romance! Signed up for your blog by email. Thanks for the giveaway. Happy Valentine’s Day!